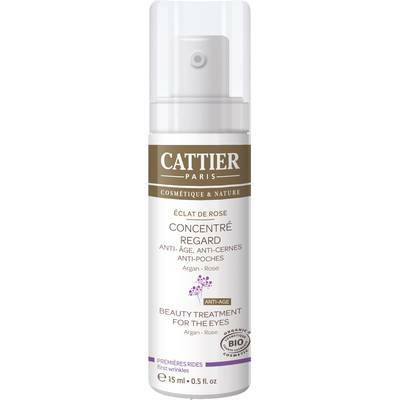 Éclat de Rose care is a beauty treatment for the eyes. Organic argan oil encourages cellular energy, intensely moisturises the epidermis and strengthens its elasticity. A cocktail of active ingredients (black wheat wax and alga extracts) relieves congestion and reduces the colour of dark circles. Butterfly lavender extract fights against expression wrinkles thanks to its smoothing properties. Organic rose extract, a gem of a beauty product, soothes and refreshes the skin. This care tones the area around the eyes and alleviates bags and fine lines. The eyes are more luminous. Aqua, Coco-caprylate/Caprate, Glycerin, Cocos Nucifera Oil*, Cetyl Alcohol, Cetearyl Alcohol, Cetearyl Glucoside, Caprylic/Capric Triglyceride ,Argania Spinosa Kernel Oil*, Silica, Benzyl Alcohol, Calendula Officinalis Extract*, Chlorella Vulgaris Extract, Hydrogenated Vegetable Oil, Lavandula Stoechas Extract, Palmaria Palmata Extract, Polygonum Fagopyrum Seed Extract, Aloe Barbadensis Leaf Extract*, Rosa Damascena Flower Extract*, Sodium Benzoate, Potassium Sorbate, Tocopherol, Xanthan Gum, Citric Acid, Lactic Acid.